At 28, George Butler has seen a lot of the world and has stories to tell about it. His, of course, is a well travelled generation. What marks him out is where he has chosen to go and how he has told those stories. Over the past few years he has been to the barracks of his uncle’s regiment in Afghanistan, a tuberculosis clinic in Mumbai and a refugee camp on the Syrian-Turkish border. He has accounts on Facebook and Twitter, and uploads the occasional snap on both. Most of his postings, however, are of images that demand a more considered approach: illustrations in pen, ink and watercolour that take him anything from 20 minutes to a couple of hours. Since graduating with a degree in illustration from Kingston University in 2007, he has driven from London to Libreville, the capital of the West African state of Gabon. 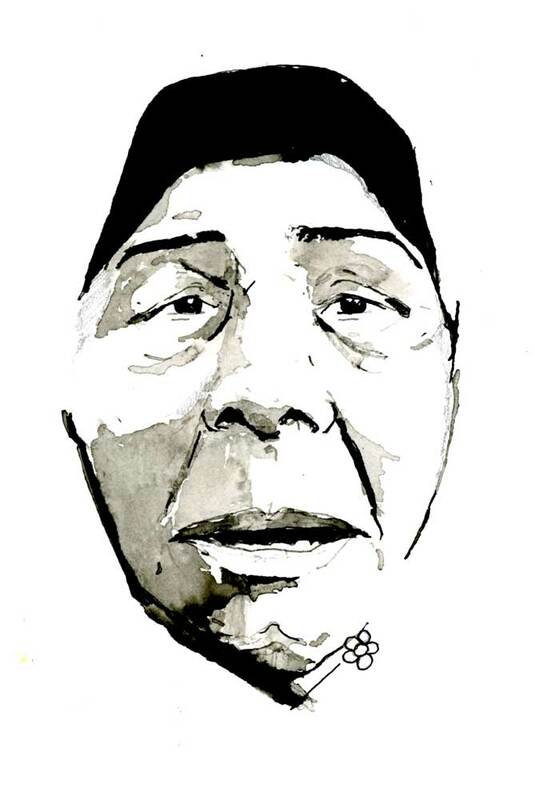 He has drawn oilfields in Azerbaijan, firefighters in New York and elephants in India. His work has appeared in several national newspapers and in the publications of charities including Médecins Sans Frontières. It was for MSF and the British charity Syria Relief that he made his second trip into Syria, in February of this year. 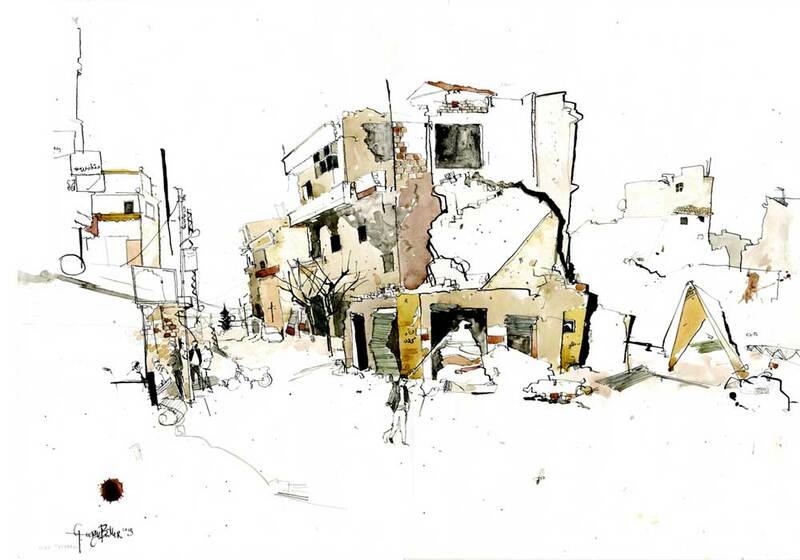 In August 2012 he had walked from Turkey across the border and, as an unofficial guest of the Rebel Free Syrian Army, spent four days drawing people and places in the war-damaged northern town of Azaz. 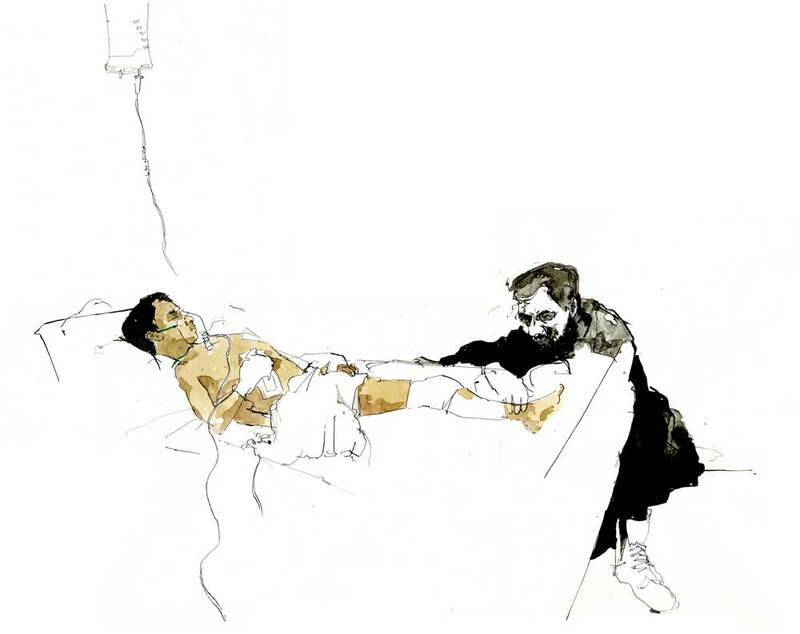 On his return, his brief was to document life in the field hospitals and refugee camps. He describes his work as “reportage illustration”. “I’m looking to record things the way a photojournalist would; things that I think are interesting or perhaps people misunderstand or don’t know very much about,” he says. “I try to describe them as accurately and with as much feeling for my subjects’ experience as I can. Another two of his subjects, drawn in a refugee camp in Turkey, were Nazak Kurdi, a 62-year-old geography teacher from Damascus, and Khalid, an 11-year-old recently orphaned boy she had adopted. Nazak, known in the camp as “Mama Nazak”, told Butler she had suffered herself in the 1980s at the hands of Hafez al-Assad’s regime – she was hanged by her hands for 20 days for her refusal to support the Ba’ath Party – and when the Syrian revolution began she tried to prevent her sons from getting involved. She failed: the eldest was killed while launching rockets; the youngest was shot trying to save him and has lost the use of his hands; and the middle son, in a separate incident, was shot in the back and is now paralysed from the waist down. Khalid, the boy Nazak has adopted, had fled with his parents from constant shelling in their village. They were given shelter by another family near Azaz. His mother, feeling safer, made the mistake of telling her host that her elder sons were fighting for the Free Syrian Army. He betrayed her. Troops of a pro-regime militia came and shot Khalid’s father at the door of the house. Khalid and his mother escaped through a window, taking a bus to the border, where they were intercepted at a checkpoint. His mother dropped him from the bus, telling him to run. He did, and hid himself. Minutes later, he saw his mother being beheaded with a sword. For more about George Butler’s work, see georgebutler.org. For more about the Syrian Supper Club, see syriansupperclub.wordpress.com.